Dr. Francis de los Reyes speaks at "Reinventing the Toilet" in India. Dr. Francis de los Reyes, Professor of Environmental Engineering and University Faculty Scholar, received the 2017 Steven K. Dentel Award for Global Outreach from the Association of Environmental Engineering and Science Professors (AEESP). This annual award honors a faculty member who has made outstanding contributions and demonstrated leadership through involvement in environmental engineering and science outreach activities to the global community. Dr. de Los Reyes was recognized for his research and education collaborations in the Philippines, South Africa, Malawi, China, India, the UK, and Brazil. His passion for developing low-cost, sustainable solutions to sanitation challenges in developing countries has helped improve public health and human dignity for underserved communities around the world. Dr. de los Reyes is leading the Global Water, Sanitation, and Hygiene Faculty Cluster, which aims to create a leading research and education program in WaSH at NC State University. He will receive the award at the AEESP Research and Education Conference at the University of Michigan in June 2017. 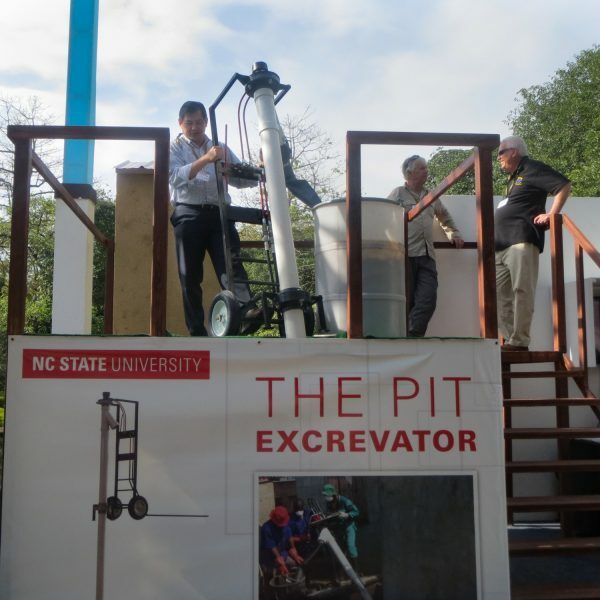 Dr. Francis de los Reyes demonstrates the Pit Excrevator technology at the “Reinvent the Toilet Fair” in India.